Several pedestrians were injured in an accident during which a van crashed into an MTA bus sending both vehicles into a group of a dozen pedestrians at a bus stop and ending their course in a pizza parlor. 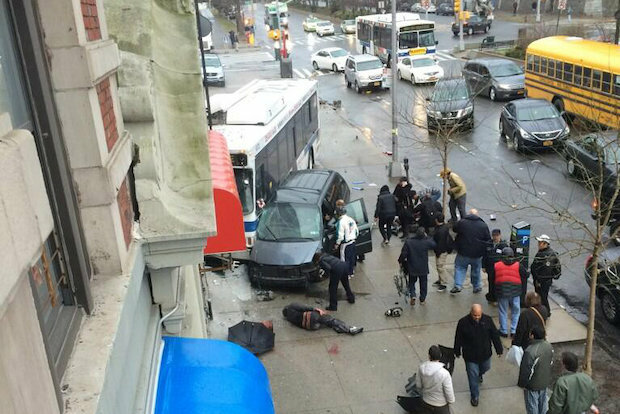 The bus accident happened in NYC in Washington Heights, on Broadway and 155th Street. Both the bus – which had no passengers – and the van were heading north when the van side-swiped the bus causing it to lose control and plowing through about a dozen people waiting at an M4 stop, city officials said.